MOST FLYFISHERMEN are so intent on their own processes — making the right cast, mending correctly, and watching the fly or strike indicator — that they don’t bother to observe what the other anglers on the river are doing. When you work as a fishing guide, however, you spend a lot of time, without a rod in your hand, watching other people fish. It’s an interesting experience, because you get to see many different angling styles — some good, some not so good — and you develop a keen eye for anticipating the most common mistakes that fly fishermen make. If you can keep your client from committing one of these angling sins, he’s got a better chance of catching fish. When you’re fishing a bend in a river, make sure that you fish the water close to you before you cast to the real “lunker water” against the far bank. Start from the tailout and work upstream, beginning at the tailout (A). 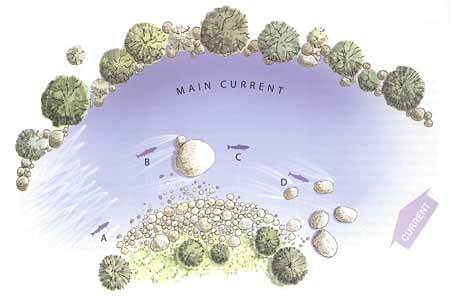 Next, look for trout near any rocks or structure on the inside of the main current (B). Oftentimes, there will be fish lying right out in the open on the inside of the bend (C); these fish are usually quite wary, so you need to be stealthy and make delicate presentations. Finally, look for fish at the head of the pool (D) where there are rocks that break the current. One such blunder — which, interestingly enough, I saw committed regularly by both novice and skilled anglers — occurs when a fisherman is in such a rush to cast to fish on the far side of a river that he charges into the water, thereby spooking any fish that may be lying on the near side. In my experience, anglers make this mistake most often on river bends, where the main current has dug out a deep slot on the outside of the turn. Unfortunately, many anglers get so caught up in thinking about the potential lunkers holding near the main current that they don’t consider an important fact — that there are probably a lot of other fish in the pool. And some of those fish may be holding on the inside of the bend, in the exact spot where the angler wants to stand so he can cast to those hogs near the far bank. Here are some strategies for fishing all the available trout lies, not just the the most obvious ones, in a riverbend pool. Before you wade in and start casting, stop well back from the water’s edge and survey the pool. (This, of course, is a good idea in almost all angling situations.) You may be able to see trout lying on the inside of the bend. It’s sometimes hard to figure out why trout choose certain spots that seem to offer no protection. Many times, I’ve seen big fish finning lazily in 8 inches of water, over a sandy bottom, well out of the main current on the inside of a bend. These are the fish that impatient anglers often never see. If the water is only a couple of feet deep, try a dry fly alone or with an unweighted nymph as a dropper. This kind of sight-fishing is among the more exciting angling experiences because you can watch everything unfold. You can see exactly where your fly lands in relation to the fish; you can see whether or not the fly will drift into the fish’s feeding lane; and you can watch the take, even if the fish goes for the nymph. Because trout on the inside of a bend know that they are vulnerable to predators, however, they are often quite skittish, so your presentation must be accurate and delicate. Even if you don’t see any trout at first glance, assume that there are fish holding on the inside of the main current. I like to work upstream, so I usually start by looking at the tailout. After it sweeps around the outside of the bend, the main current is usually pretty fast where it enters the tailout, so trout will often hang out on the inside edge of the current, where they don’t have to do so much work.